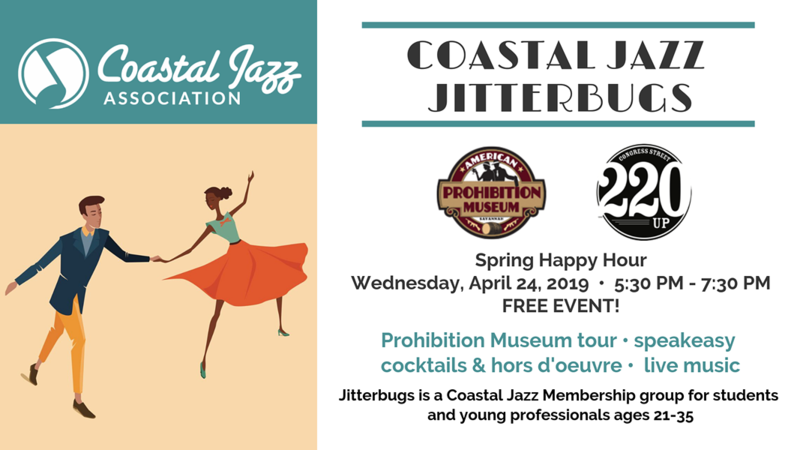 When: Wed., April 24, 5:30-7:30 p.m.
-Jitterbugs is a Coastal Jazz Association membership for college students and young professionals, ages 21 - 35!- The Jitterbug’s Spring Happy Hour: Jitterbugs will enjoy a fascinating docent-lead tour of the amazing American Prohibition Museum, enjoy a complimentary jazzy cocktail, Belford's hors d'oeuvres and live music in the museum's speakeasy, Congress Street Up! American Prohibition Museum tours will take place from 5:30 - 6:30 PM. Please enter the museum from the 209 West Saint Julian Street entrance. Cocktails, hors d'oeuvres and live music.